Mr Bush has never laid out his strategy in this way before(?) says the BBC. So, the plan for the media is now that we are not actually winning,… but that we are going to start withdrawing,… and that all of the sudden there is a plan for this,… and that this has never, ever been discussed,… and that it was just thrown together,… this past week! What’s next? 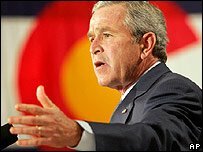 That it was because of the brave service of the Democrats in Congress that there is “finally a plan” for withdrawing from Iraq! But, does this mean that we won? I can’t wait to hear how they explain that! Note, that the AP is not quite bought into the idea that any of that is true, but at least they do report it as heresay. This could be a historic time for the Western media. After reporting that the war has been a complete failure for months and two years, they now have to change their whole storyline while trying to save face at the same time. What a quagmire they’ve dug for themselves! So who is really trying to persuade Americans that they have a new plan?